No doubt soccer is a male dominated sport; certain female athletes do make a mark here and there. However when it comes to female soccer players, the name Nadine Angerer is enough to make even some of the best male soccer players bow with respect. The German goalkeeper is one not many liked going up against especially when it came to penalty shoot outs. The two time world champion called an end to her 15 year long career in 2015 at the Women’s World Cup in Canada. Side by side to soccer Angerer also trained professionally as a physiotherapist even taking time off from soccer for two years to get her certification. Today Angerer can be found coaching the Portland Thorns in America which she consider to be her second home. Nadine Marejke Angerer was born in November 1978 in Lohr a Main, West Germany. A tomboy at heart, Angerer grew up playing soccer with the boys from her neighborhood much to the chagrin of her mother. Her career began at a local German club ASV Hofstetten, where she played as a forward. It would take a few more years before her goalkeeping talents were discovered and she soon moved to another club FC Nurnberg and then later to FC Wacker Munchen. Angerer was only 17 when she made her first international cap. Throughout her international career Angerer had 146 caps. Her final appearance was in 2015 in the FIFA Women’s World Cup where she led Germany to the bronze medal against England. Angerer made her debut for her national side at the 2007 FIFA Women’s World Cup where she led Germany to win their second FIFA Women’s World Cup title. As a female soccer player Angerer had many career highlights which included remaining unbeaten in goals for her team’s duration – as astounding 540 minutes in total. It came as no surprise when Angerer was named as goalkeeper of the tournament. The two time world champion retired at the height of her career at the FIFA Women’s World Cup in 2015 in Canada. 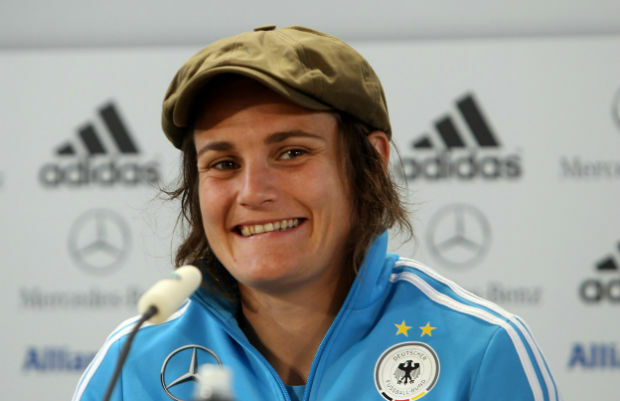 With Angerer in the lead Germany won the UEFA Women’s Euro title in 2009 and 2013. She has recorded an impressive 94 caps throughout her career playing for Germany. Apart from the Wolrd Cup Angerer’s skill enabled the German side to two Olympic bronze medals in the 200 and 2004 games. There are also three UEFA European Championships (1997, 2000 and 2005) to add to her mantle. Angerer conceded just one goal in the entire 2013 tournament before saving two penalties in the final against Norway. Angerer played briefly for the Portland Thorns in 2014, playing 22 games for the American club before retiring in 2015, Angerer chose to stay back at Portland within the capacity of a coach. Nadine Angerer has been named FIFA Women’s World Player of the Year in 2007 and 2013, along with being named the Best Goalkeeper in 2007. She was also UEFA Best Women’s Player in Europe in 2013.